How Do Firefighters Determine The Cause Of A Blaze? How Often Do Cigarettes Cause Massive Fires? Whether your favorite season is summer because of those long days at the beach or are the kind that lives for the ski slopes when the thermometers plummet in winter, who doesn’t love the transition seasons, spring and fall? It’s hard to find fault with warm spring days when everything is coming back to life. Birds are singing again and pretty much everything starts blossoming and blooming. But, as wonderful as all of that, is there really anything better than the first nip in the air that signals that fall is here? The sweltering heat of summer is past and it’s time for gorgeous color changes, long walks, football rivalries and, maybe best of all, those autumn bonfires! Most of us have fond memories of backyard bonfires when we were growing up. Some were for the purpose of burning mountains of leaves that had been raked. Others were built for “wienie roasts” and attended by the entire neighborhood. Everyone had their own special method for toasting the perfect marshmallow and the art and intricacy of building s’mores could rival many of today’s cooking shows. 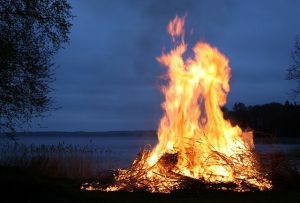 Those childhood bonfires were especially fun because they were so carefree and easy. That’s because there were adults present who were responsible for building and monitoring the fire so that no one got hurt and surrounding property was protected. Now that we are the adults, it is important to know just what all is necessary to insure a safe, fun experience for everyone. That means learning safe ways to build a bonfire. Research legal issues pertaining to your area, including dates, times, locations, etc. Tinder material, like twigs, pine needles, bark, newspaper, etc. Watch for sparks and flying embers. Be sure to have a source of water nearby, just in case. Now, the only thing is left is the search for the perfect stick to roast that wienie and toast those marshmallows! That, of course, and to remember to make sure the fire is completely out before going in for the night. When the word “Bonfire” is spoken, the hit song by Childish Gambino comes to mind. Here it is in all its glory!